Hi friends! I hope you're having a fabulous week! Before we get into this post, make sure you check out my last post and enter my giveaway for my Summer Staples! There are all sorts of goodies headed to one lovely reader, so make sure you enter! Thanks! Anyways, today I'm starting a new blog series for the summer! I'm trying to lose some weight this summer and get healthier, so I've been wanting to try out some new healthy meals that are a little different from the norm. So I picked up a little box mix called "Suddenly Salad" last week at Walmart, and whipped up a delicious healthy dinner! This specific mix was for a southwestern grain salad. Basically you boil a bag of grains with all sorts of things in it to cook the grains, then mix up the vinaigrette and combine the two. Voila! A delicious salad! I took it a bit further for today's post for a full-on meal! So let's get started! I started by cutting up the chicken breast into bite-size pieces and sautéed it with some oil, salt, pepper, and a little bit of garlic powder for flavor! While cooking the chicken, I boiled the bag of grains that came in the box mix. It was really cool, because all of the grains and veggies were in this mesh bag that stays enclosed until it's done cooking! While everything else is cooking away, I whipped up the vinaigrette that came in the box. It gives you all the instructions on the back, and it's very easy! Once the grains are done cooking, you strain out the water and run the bag under cool water and let it all drain out. Then, cut the bag and dump all of it's goodness into the bowl that has the vinaigrette and stir so the vinaigrette coats the grain mixture. And stir it al up! Here's a peek at the nutrition facts of this grain salad mix! Not too shabby! Enjoy! This is a really delicious mix, I gotta say! You can eat it warm or cold, I prefer cold because it's super refreshing! The box says that it has 4 servings, so to make sure I stuck to that, before I dug into the deliciousness I put the other three servings away so I wouldn't be tempted to eat it all! It also made for a great lunch the next day! And we're done! It was the perfect healthy dinner that is light yet still gives you nutrition and it's super tasty! I hope you guys liked seeing this healthy summer meal! 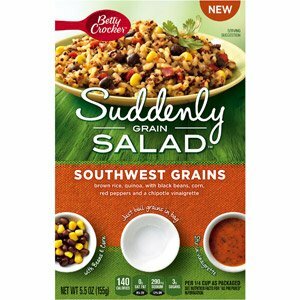 I really want to try the other Suddenly Grain Salad flavors too! Let me know if you try this out and make sure you tag me on Instagram or Twitter if you do @allieelliott! Also, if you want to see a specific healthy meal from me, let me know in the comments! I love trying new things! !